Both Corrective and Preventative maintenance processes exist in the Plant Maintenance module. Corrective maintenance refers to the activities conducted by the Maintenance Organization to repair equipment of all forms within their area of responsibility. Preventive maintenance is a discipline that uses processes and activities that focus on the prevention of failures or performance degradation before it occurs. Management of Technical Objects - includes master data objects such as functional locations and equipment master records. 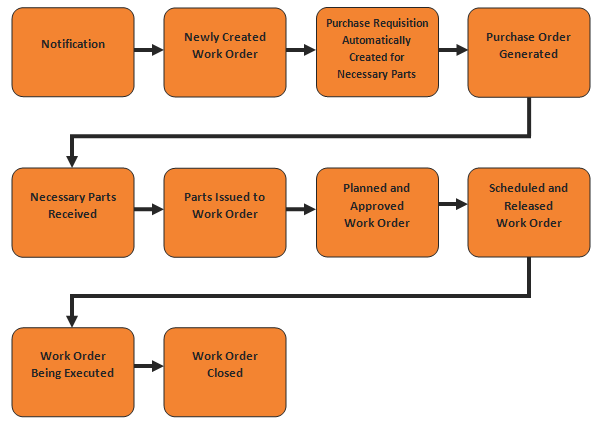 Maintenance Processing - includes processing steps such as notifications and work orders. Preventative Maintenance - includes maintenance planning and work scheduling tasks.